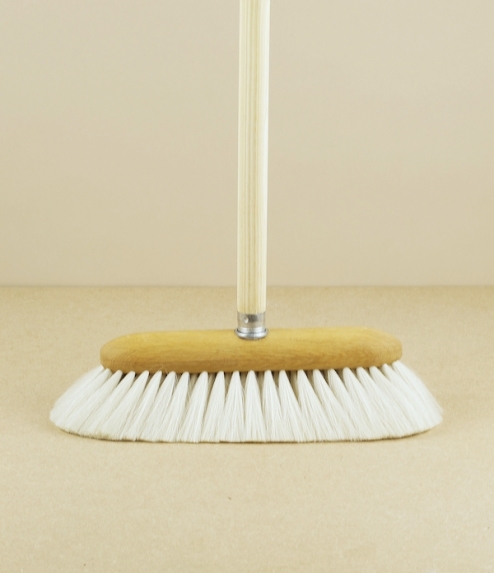 A beautiful low kick broom ideal for delicate parquet, hardwood, marble, or smooth stone floors. Made of exceptionally soft goat-hair hand sewn into an oiled oak stock. From a family owned and run brush making workshop in the town of Versmold, in North Rhine-Westphalia, a company who since the 1930s have specialised in the hand manufacture of fine brushes from largely natural materials. Supplied without a handle due to the cost of posting, but with a German adaptor for the fitting of standard (approximately 23mm) wooden broom handles.